Kara McKormich is told she's auditioning to star in a new teen variety show. It's what she isn't told that could change her life. The feisty New Yorker moves to sunny Orlando to participate in a month-long audition, where she'll live with nine other contestants and an eccentic housemother. Kara knows that the show already has a big-time celebrity lined up for the co-host, but she doesn't know who it is. Chad Beacon quickly rose to fame after winning America's Next Star, but he doesn't want his entire career to be about singing. There is so much more he wants to do--like act. The new variety show sounds like the perfect next step for him, but his parents want him to have a co-star who shares his faith since they'll be spending so much time together. Acting is high on Kara's priority list. But a relationship with God? Not so much. But God is after Kara's heart and He's put people in her life who are showing her there's far more to Christianity than rules and judgment. And just when it seems that Kara's going to have to give up her acting dream, God reveals that she may have a starring role after all--in a story so big only He could write it. 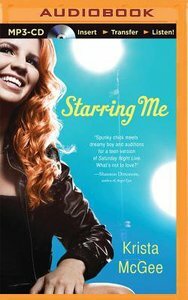 About "Starring Me (Unabridged, Mp3)"
Krista McGee writes for teens, teaches teens, and is raising teens. Along with her husband and three kids, Krista has lived and ministered in Texas, Costa Rica, and Spain. Customer Reviews For "Starring Me (Unabridged, Mp3)"
I loved this book! It was such a mixture of fun, craziness and real, gritty depth. I fell in love with Kara and her infectious personality in the previous book (First Date) so it was great to be able to read her story in this one and watch her journey not only to love (because don't we all love a good romance!) but also to faith, and the fact that she didn't just turn around and decide to accept Christ but really challenged and worked through what it all meant and why. Really, highly recommend this book not only to teens (who it's aimed at) but also their parents and anyone who enjoys a good, fun romance with some great spiritual truths alongside. Kara McKormick and Addy Davidson were roommates on The Book of Love, a reality TV show searching for a prom date for the son of the President of the United States. Neither girl won the date, but Addy won the boy. Now Kara has been asked to audition for the female co-host of a new teen TV show. She gets through the first round of auditions and finds herself in Florida for a month with nine other girls, all competing for the same role. There were a lot of positive aspects to the book, including Kara's spiritual journey, the scenes with Addy and Jonathon (it's always nice when the characters in the first book are still part of the second), and the clear gospel message. I'd recommend this book to any tween or teen girl with an interest in celebrities (isn't that all of them?). Thanks to Thomas Nelson and BookSneeze for providing a free ebook for review.